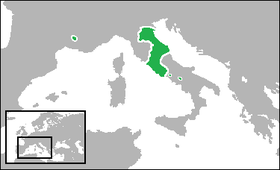 The Papal States were territories in the Italian Peninsula under the sovereign direct rule of the pope, from the 8th century until 1870. 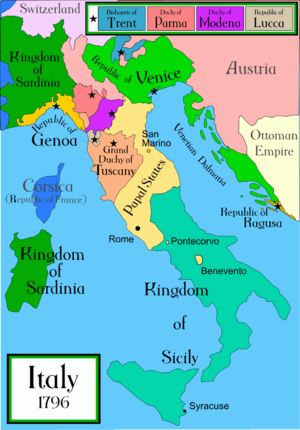 They were among the major states of Italy from roughly the 8th century until the Italian Peninsula was unified in 1871 by the Kingdom of Piedmont-Sardinia. 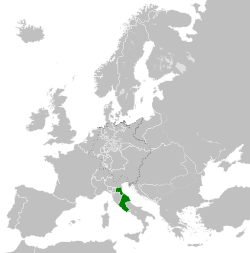 At their zenith, they covered most of the modern Italian regions of Lazio (which includes Rome), Marche, Umbria and Romagna, and portions of Emilia. These holdings were considered to be a manifestation of the temporal power of the pope, as opposed to his ecclesiastical primacy. 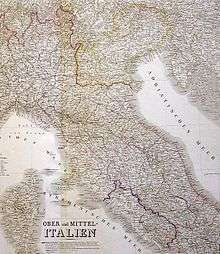 By 1861, much of the Papal States' territory had been conquered by the Kingdom of Italy. Only Lazio, including Rome, remained under the Pope's temporal control. In 1870, the pope lost Lazio and Rome and had no physical territory at all, not even the Vatican. Italian Fascist leader Benito Mussolini ended the crisis between unified Italy and the Vatican by signing the Lateran Treaty granting the Vatican City State sovereignty. The Papal States were also known as the Papal State (although the plural is usually preferred, the singular is equally correct as the polity was more than a mere personal union). The territories were also referred to variously as the State(s) of the Church, the Pontifical States, the Ecclesiastical States, or the Roman States (Italian: Stato Pontificio, also Stato della Chiesa, Stati della Chiesa, Stati Pontifici, and Stato Ecclesiastico; Latin: Status Pontificius, also Dicio Pontificia). For its first 300 years the Catholic Church was persecuted and unrecognized, unable to hold or transfer property. Early congregations met in rooms set aside for that purpose in the homes of well-to-do individuals, and a number of early churches, known as titular churches and located on the outskirts of Ancient Rome, were held as property by individuals, rather than by the Church itself. Nonetheless, the properties held nominally or actually by individual members of the Roman churches would usually be considered as a common patrimony handed over successively to the legitimate 'heir' of that property, often its senior deacons, who were, in turn, assistants to the local bishop. This common patrimony attached to the churches at Rome, and thus under its ruling bishop, became quite considerable, including as it did not only houses et al in Rome or near by but landed estates, whole or in part, across Italy and beyond. (Allen Brent, A Political History Of Early Christianity) This system began to change during the reign of the emperor Constantine I, who made Christianity legal within the Roman Empire, and restoring to it any properties that had been confiscated (in the larger cities of the empire this would have been quite considerable, and the Roman patrimony not least among them). The Lateran Palace was the first significant new donation to the Church, most probably a gift from Constantine himself. Other donations followed, primarily in mainland Italy but also in the provinces of the Roman Empire. But the Church held all of these lands as a private landowner, not as a sovereign entity. When in the 5th century the Italian peninsula passed under the control of Odoacer and, later, the Ostrogoths, the church organization in Italy, with the pope at its head, submitted to their sovereign authority while asserting their spiritual primacy over the whole Church. The seeds of the Papal States as a sovereign political entity were planted in the 6th century. The Byzantine Empire based in Constantinople launched a reconquest of Italy that took decades and devastated Italy's political and economic structures. Just as these wars wound down, the Lombards entered the peninsula from the north and conquered much of the countryside. By the 7th century, Byzantine authority was largely limited to a diagonal band running roughly from Ravenna, where the Emperor's representative, or Exarch, was located, to Rome and south to Naples (the "Rome-Ravenna corridor"), plus coastal enclaves. The Church's independence, combined with popular support for the papacy in Italy, enabled various popes to defy the will of the Byzantine emperor; Pope Gregory II even excommunicated Emperor Leo III during the Iconoclastic Controversy. Nevertheless, the pope and the exarch still worked together to control the rising power of the Lombards in Italy. As Byzantine power weakened, though, the papacy took an ever larger role in defending Rome from the Lombards, usually through diplomacy. In practice, the papal efforts served to focus Lombard aggrandizement on the exarch and Ravenna. 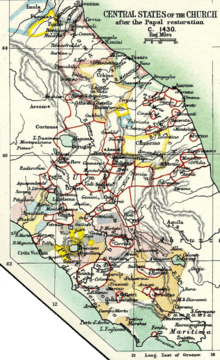 A climactic moment in the founding of the Papal States was the agreement over boundaries embodied in the Lombard king Liutprand's Donation of Sutri (728) to Pope Gregory II. The precise nature of the relationship between the popes and emperors – and between the Papal States and the Empire – is disputed. It was unclear whether the Papal States were a separate realm with the pope as their sovereign ruler, merely a part of the Frankish Empire over which the popes had administrative control, as suggested in the late 9th century treatise Libellus de imperatoria potestate in urbe Roma, or whether the Holy Roman Emperors were vicars of the pope (as a sort of Archemperor) ruling Christendom, with the pope directly responsible only for the environs of Rome and spiritual duties. Papal responsibilities were often (as in the early 16th century) in conflict. The Papal States were involved in at least 3 wars in the first 2 decades. Pope Julius II, the "Warrior Pope", fought on their behalf. The Reformation began in 1517. Before the Holy Roman Empire fought the Protestants, its soldiers (including many Protestants), sacked Rome as a side effect of battles over the Papal States. A generation later the armies of King Philip II of Spain defeated those of Pope Paul IV over the same issues. The French Revolution proved as disastrous for the temporal territories of the Papacy as it was for the Roman Church in general. In 1791 the Comtat Venaissin and Avignon were annexed by France. Later, with the French invasion of Italy in 1796, the Legations (the Papal States' northern territories) were seized and became part of the Cisalpine Republic. Two years later, the Papal States as a whole were invaded by French forces, who declared a Roman Republic. Pope Pius VI fled to Siena, and died in exile in Valence (France) in 1799. The Papal States were restored in June 1800 and Pope Pius VII took up residency once again, but the French under Napoleon again invaded in 1808, and this time the remainder of the States of the Church were annexed to France, forming the départements of Tibre and Trasimène. With the fall of the Napoleonic system in 1814, the Papal States were restored once more. 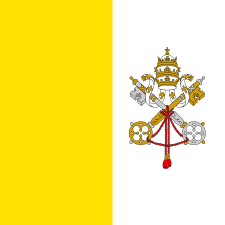 From 1814 until the death of Pope Gregory XVI in 1846, the popes followed a reactionary policy in the Papal States. For instance, the city of Rome maintained the last Jewish ghetto in Western Europe. There were hopes that this would change when Pope Pius IX was elected to succeed Gregory and began to introduce liberal reforms. A unified Kingdom of Italy was declared and in March 1861, the first Italian parliament, which met in Turin, the old capital of Piedmont, declared Rome the capital of the new Kingdom. However, the Italian government could not take possession of the city because a French garrison in Rome protected Pope Pius IX. The opportunity for the Kingdom of Italy to eliminate the Papal States came in 1870; the outbreak of the Franco-Prussian War in July prompted Napoleon III to recall his garrison from Rome and the collapse of the Second French Empire at the Battle of Sedan deprived Rome of its French protector. King Victor Emmanuel II at first aimed at a peaceful conquest of the city and proposed sending troops into Rome, under the guise of offering protection to the pope. When the pope refused, Italy declared war on September 10, 1870, and the Italian Army, commanded by General Raffaele Cadorna, crossed the frontier of the papal territory on September 11 and advanced slowly toward Rome. The Italian Army reached the Aurelian Walls on September 19 and placed Rome under a state of siege. Although the pope's tiny army was incapable of defending the city, Pius IX ordered it to put up at more than a token resistance to emphasize that Italy was acquiring Rome by force and not consent. This incidentally served the purposes of the Italian State and gave rise to the myth of the Breach of Porta Pia, in reality a tame affair involving a cannonade at close range that demolished a 1600-year-old wall in poor repair. Pope Pius IX ordered the commander of the papal forces to limit the defense of the city in order to avoid bloodshed. The city was captured on September 20, 1870. Rome and what was left of the Papal States were annexed to the Kingdom of Italy as a result of a plebiscite the following October. This marked the definite end of the Papal States. Despite the fact that the traditionally Catholic powers did not come to the pope's aid, the papacy rejected any substantial accommodation with the Italian Kingdom, especially any proposal which required the pope to become an Italian subject. 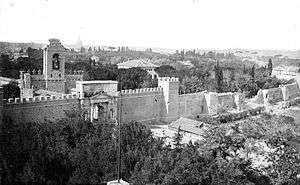 Instead the papacy confined itself (see Prisoner in the Vatican) to the Apostolic Palace and adjacent buildings in the loop of the ancient fortifications known as the Leonine City, on Vatican Hill. From there it maintained a number of features pertaining to sovereignty, such as diplomatic relations, since in canon law these were inherent in the papacy. 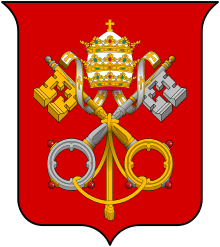 In the 1920s, the papacy – then under Pius XI—renounced the bulk of the Papal States and the Lateran Treaty with Italy (then ruled by the National Fascist Party under Benito Mussolini) was signed on February 11 1929, creating the State of the Vatican City, forming the sovereign territory of the Holy See, which was also indemnified to some degree for loss of territory. As the plural name Papal States indicates, the various regional components retained their identity under papal rule. The pope was represented in each province by a governor, either styled papal legate, as in the former principality of Benevento, or Bologna, Romagna, and the March of Ancona; or papal delegate, as in the former duchy of Pontecorvo and in the Campagne and Maritime Province. Historically the Papal States maintained military forces composed of volunteers and mercenaries. 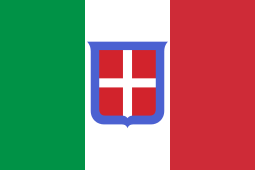 Between 1860 and 1870 the Papal Army (Esercito Pontificio in Italian) comprised two regiments of locally recruited Italian infantry, two Swiss regiments and a battalion of Irish volunteers, plus artillery and dragoons. 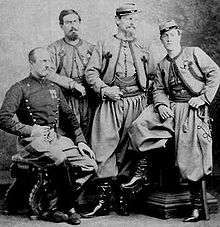 In 1861 an international Catholic volunteer corps, called Papal Zouaves after a kind of French colonial native Algerian infantry, and imitating their uniform type, was created. Predominantly made up of Dutch, French and Belgian volunteers, this corps saw service against Garibaldi's Redshirts, local brigands, and finally the forces of the newly united Italy. The Papal Army was disbanded in 1870, leaving only the Palatine Guard, which was itself disbanded on 14 September 1970 by Pope Paul VI, and the Swiss Guard, which continues to serve both as a ceremonial unit at the Vatican and as the pope's protective force. ↑ Mitchell, S.A. (1840). Mitchell's geographical reader. Thomas, Cowperthwait & Co. p. 368. ↑ McEvedy, Colin (1961). The Penguin atlas of medieval history. Penguin Books. p. 32. (...) separated from their theoretical overlord in Pavia by the continuing Imperial control of the Rome-Ravenna corridor. ↑ Kleinhenz 2004, p. 1060. ↑ "Sutri". From Civitavecchia to Civita Castellana. Retrieved 27 August 2012. ↑ Kleinhenz 2004, p. 324. ↑ Tucker 2009, p. 332. ↑ Spielvogel 2013, pp. 245-246. ↑ Elm & Mixson 2015, p. 154. ↑ Watanabe 2013, p. 241. ↑ Kleinhenz 2004, pp. 220, 982. ↑ Menache 2003, p. 142. ↑ Waley 1966, p. 62. ↑ Kleinhenz 2004, p. 802. ↑ Ruggiero 2014, p. 225. 1 2 3 Ruggiero 2014, p. 227. ↑ Watanabe 2013, p. 19. ↑ Ganse, Alexander. "History of the Papal States". World History at KDMLA. Korean Minjok Leadership Academy. Retrieved 7 March 2013. ↑ Durant, Will (1953). The Renaissance. Chapter XXI: The Political Collapse: 1494–1534. ↑ Durant, Will (1953). The Renaissance. Chapter XXXIX: The popes and the Council: 1517–1565. ↑ Hanlon 2008, p. 134. ↑ Domenico 2002, p. 85. ↑ Gross 2004, p. 40. 1 2 3 4 5 6 7 8 Hanson 2015, p. 252. ↑ Roessler & Miklos 2003, p. 149. ↑ Fischer 2011, p. 136. ↑ Abulafia, David (2003). "The Mediterranean as a battleground". The Mediterranean in History. Getty Publication. p. 268. ISBN 978-0892367252. (...) under Giuseppe Garibaldi to overthrow the Neapolitan Bourbons. After defeating a Neapolitan force at Calatafirmi, Caribaldi captured Palermo after three days of street fighting. ↑ "History of the Pontifical Swiss Guard". Retrieved 30 August 2016. 1 2 De Grand 2004, p. 89. ↑ Brandani, Massimo (1976). L'Esercito Pontificio da Castelfidardo a Porta Pia. Milan: Intergest. p. 6. ↑ Levillain 2002, p. 1095. This article incorporates text from a publication now in the public domain: Herbermann, Charles, ed. (1913). "States of the Church". Catholic Encyclopedia. New York: Robert Appleton.